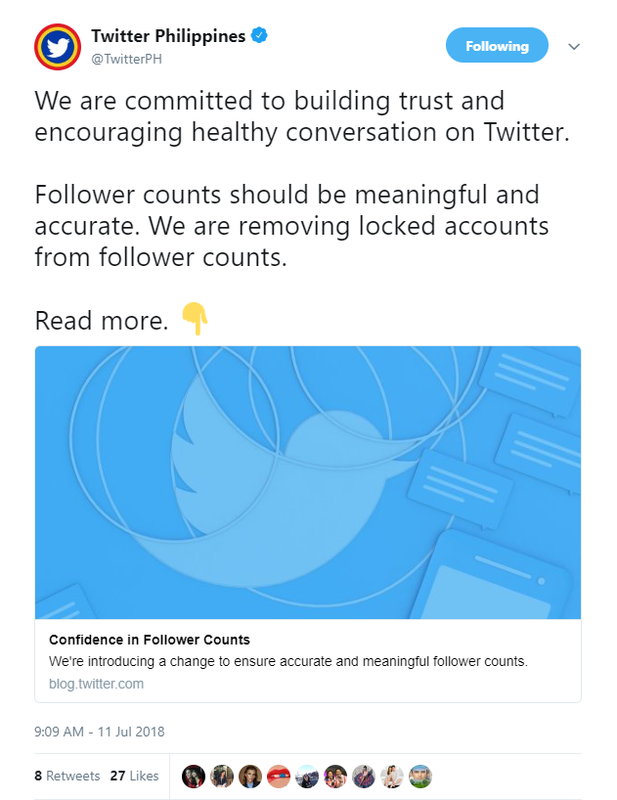 Twitter announces its latest efforts to build trust and encourage healthy conversation on the platform with the removal of locked accounts that may result to a change in the number of followers displayed on many profiles. Most people will see a change of four followers or fewer; others with larger follower counts will experience a more significant drop. Follower counts on Twitter is a visible feature, and Twitter wants everyone to have confidence that the numbers are meaningful and accurate. Over the years, the company has locked accounts when sudden changes in account behavior were detected. In these situations, Twitter reaches out to the owner of the account and unless they validate the account and reset the passwords, Twitter will keep them locked with no ability to log in. This week, the company will be removing these locked accounts from follower counts across profiles globally. ● An account can get locked when Twitter detect sudden changes in account behavior; they may lock the account and contact the owner to confirm they still have control of it. These sudden changes in account behavior could include Tweeting a large volume of unsolicited replies or mentions, Tweeting misleading links, or if a large number of accounts block the account after mentioning them. Twitter sometimes locks an account if they see email and password combinations from other services posted online and believes that information could put the security of an account at risk — so it requires accounts to change their passwords for protection. Until the platform confirms that the account is authentic, it locks it which makes the user unable to Tweet or see ads. ● These accounts are different from spam or bots. In most cases, these accounts were created by real people but Twitter cannot confirm that the original person who opened the account still has control and access to it. Spam accounts (sometimes referred to as bot accounts) typically exhibit spammy behavior from the beginning, and are increasingly predictable by their systems. Twitter can use technology to automatically shut them down. ● This specific update is currently focused on followers because it is one of the most visible features on their service and often associated with account credibility. Twitter’s ongoing work to improve the health of conversations on the platform encompasses all aspects of its service. Once an account is locked, it cannot Tweet, like, or Retweet; it is not served ads. ● This change will not affect Twitter’s Monthly Active User (MAU) or Daily Active User (DAU) metrics. Removing locked accounts from followers doesn’t impact MAU or DAU. Locked accounts that have not reset their password in more than one month are not included in MAU or DAU. This is another step to improve Twitter for everyone, and ensure everyone has confidence in their followers. Xaxis an audience-buying company under GroupM has launched in Malaysia, providing regional marketers its full suite of solutions a..
Leo Burnett China names Sharon Chen as chief strategy officer to lead the agency’s strategy function and work closely with CEO Dan..